I participate in various forms of movement and physical activity but I think I would have to say that running is definitely my physical activity of choice, or at least I am most stubborn about it. There is something about just being outside with your thoughts, listening to your breathing or boom of super loud music in your ears, that just makes me so happy. I have mentioned before that when I am not feeling super motivated I will purchase a new pair of running socks to get me excited about running. Socks are my go to because out of all the running gear I could be buying to motivate myself socks are the cheapest. But this got me thinking what are my favourite running things? This is when I realized there are very few things besides my running watch (which I honestly feel could be any brand), orthotics and sun block there are only a handful of things I feel I couldn’t live without. So here they are the items I feel like without them running would be that much more difficult. 1. Lululemon Stuff Your Bra: This bra is nothing short of incredible! Not only does it offer amazing support, the bra itself has tiny little pockets for your keys, cell phone, tissue, lip gloss, tiny little sunblocks. Sure it is a bra so you don’t want to be stuffing a water bottle in there, but for a house key or your iPod or cell phone this bra is perfect. The addition of items to the bra’s pockets doesn’t compromise the support it offers, this bra is also awesome in the gym to carry around your music so you don’t have ear phone cables all over the place. 2. Lululemon Run Inspire Crop: another lulu gem. I love these pants because the mesh on the back of the leg. I am not much for running in shorts on longer runs however that can become challenging on hot days. The mesh helps to cool down your leg while still giving you some good coverage. Also as #1 didn’t give you enough options for storing things, these guys have a nice little pocket on your backside for keys, cards or whatever you would like to put in there. 3. Fuel Belt: The fuel belt above is from the Running Room, it isn’t necessarily my very favourite ever but it is one that has lasted me over 5 years and came in at under $25 so I really have no complaints. Regardless of the brand you choose if you are running more than 5k and it is warm out you should be bringing some water with you and for body balance reasons I find hands free is the best way to go. 4. WATER BOTTLES: as mentioned above water and hydrating is an absolute must during your day, and more importantly when you are outside in the sun being active. Personally I have two of these little guys threaded onto my fuel belt, one is filled with straight up water and the second normally has some type of electrolyte concoction in it. I like these little bottles because they aren’t overly heavy, and to be honest running with water can be annoying but I am always thankful for it after a long run. 5. Running Hats: I am sure I have mentioned this in the past. I don’t do well with sunglasses, I get too sweaty behind them and become uncomfortable pretty quickly. I prefer a hat, not only for the reduced sweatiness but also for the protection from the sun. I am a ginger and therefore burn pretty easily, plus who doesn’t want to protect their face from the harmful rays of the sun? Now there is a difference between a regular old baseball hat and a running hat. Running hats are so much lighter and breathable than other hats out there. To be honest I have no idea what brand my hat is, I went to a Sport Check and bought a hat for $20, the back is mesh and the rest of the hat is made of light weight material. There you have it. 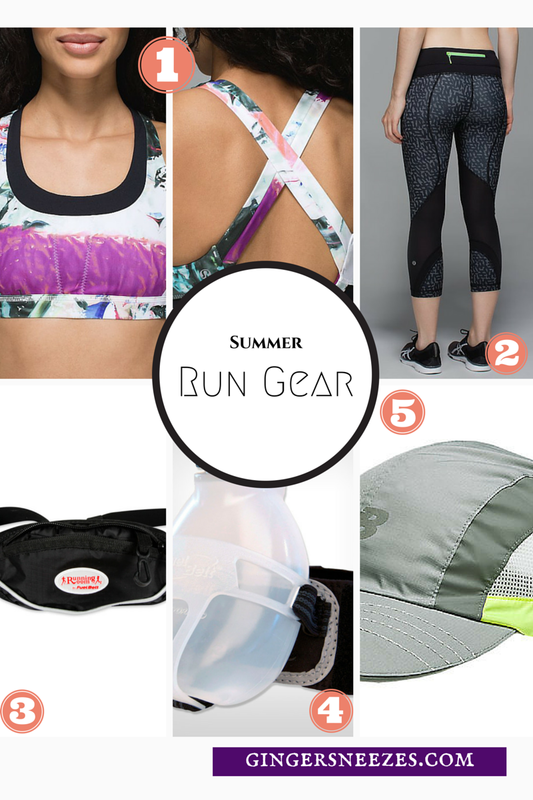 These are my tired and true items, if you didn’t notice I am not much for spending huge amounts of cash on my running gear (I guess besides my slight Lululemon obsession). I find the key to good summer running gear is to make sure the materials used are light weight, breathable and whenever possible moisture wicking! I understand that I didn’t list my running shoes here which are arguably a must have when running, however when it comes to shoes we all have very different needs and feet. Personally I tend to buy the same brand year after year, but always try on various brands when purchasing a new pair because designs change, shoes fit differently from year to year and you never know when you might find something that is better suited to your needs. 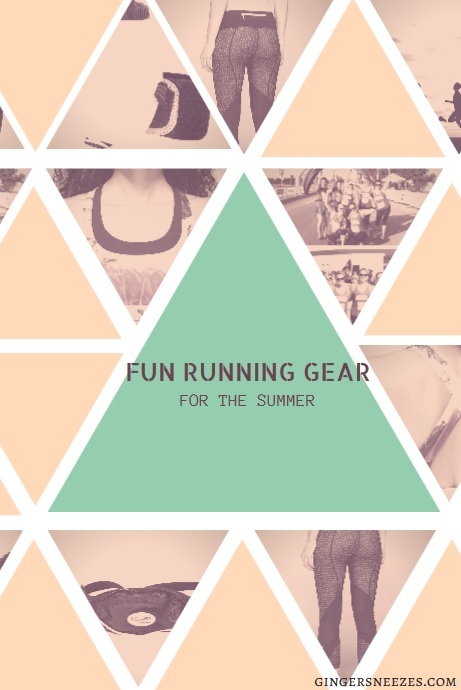 Let me know what your favourite running gear is in the comments below, I am always on the look out for fun new running stuff. This entry was posted in Fitness and tagged Clothes, clothing, Club, electrolyte, fitness, Gear, health, hyrdate, lululemon, run, run club, Running, running room, summer, Tech by healingginger. Bookmark the permalink.